White Sauce gets a bad wrap as being difficult to make and often turning out lumpy. Well, when it comes to white sauce I’m not very patient and I tend to add all of my milk at once and it never comes out lumpy! A fluke maybe? I like to think I am just extraordinarily gifted in the area of White Sauce, but I will say that I whisk it madly the whole time, so maybe that’s my secret…..Never stop Whisking!! If you’re like me, lacking in patience but loving white sauce, you might like to give this microwave recipe a try. The original recipe calls for 2 cups of cheddar cheese, but I think some parmesan adds flavour, so I use 1 cup cheddar and 1 cup parmesan. It’s really simple, and hasn’t failed me yet. I have also used it to make some Macaroni Cheese for the kids, and when I have run out of Chicken Stock I have just increased the amount of milk used and made a basic cheese sauce. Place the butter in a large microwave safe container and microwave for about 30 seconds, or until bubbling. Add the flour and mix well to combine. Pop back into the microwave for another 30 seconds to cook out the flour. 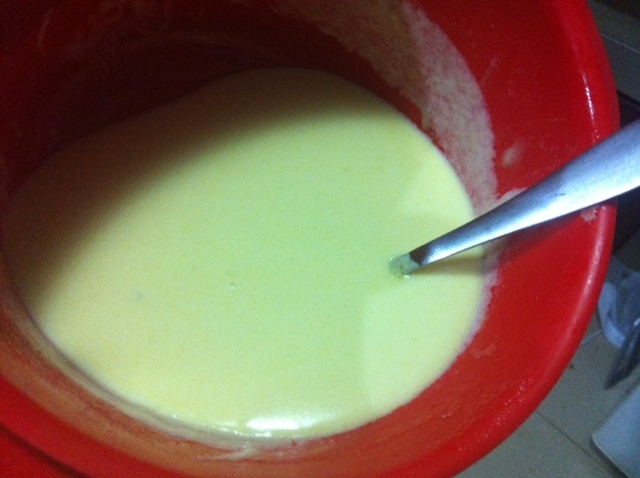 Using a whisk, slowly add the milk, making sure there are no lumps. Crumble the chicken stock cubes into the sauce and add the grated cheese. Microwave in 30 second increments and whisk well in between until the cheese is melted and the sauce is lovely and smooth.